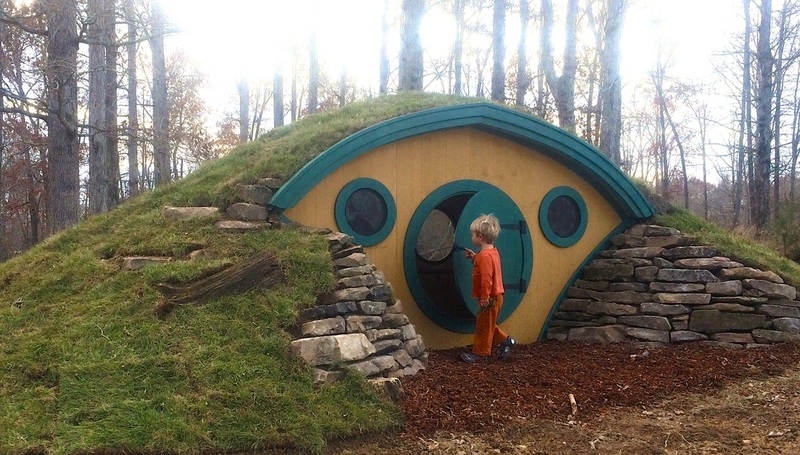 Hobbit™ Hole Playhouses... and more! Our unique wooden play house designs will transform any backyard into an outdoor play fantasy. Please scroll down for images, pricing and detailed specification information. Don't forget to Contact Us with any questions! Have the coolest clubhouse on the block with the spacious Big Merry! Floor dimensions are 10' x 6'. Comes with a 40" diameter round front door, one 20" round window offset from the front door, and two 24" round windows on the back wall. Our high quality "Merry" Hobbit Hole playhouse kits come standard with: eased edge cedar framing; 1" x 10" shiplap pine siding; v-match pine roof sheathing; stain grade pine trim; forged iron door hinges; and a set of screen and plexiglass inserts for each window. Floor dimensions are 7'6" x 4'. Comes with a 3' diameter round front door, one 16" round window offset from the front door, and one 20" round window centered on the back wall. 'Live edge' or 'straight edge' cedar clapboard roofing is available as an option on the base kit. Your antidote to the "big box store" options! This is our largest Hobbit Hole design available as a ready-to-assemble kit that can be shipped anywhere in the contiguous US. Floor dimensions are a whopping 12' x 7' and the floor to ceiling height at the center is 6.5', making it all but impossible to outgrow! It has a 4' diameter round front door. All Hobbit Hole designs listed on this page are shipped in kit form. We will provide all the hardware needed and assembly instructions. You will just need a few basic tools. The base price for our playhouse kits does not include finish flooring or roofing. Finish flooring is optional. Roofing is required! You can choose our cedar clapboard roofing option, or you can purchase and install your own roofing material. Your Own Corner of Middle-earth! An authentic Hobbit Hole worthy of the name "Bag End", this design will transform your landscape into a scene from the Shire. The Bag End has floor dimensions measuring 14' x 6'. The overall height of the structure is about 6.5' and the floor to ceiling height at the center is 5.5'. The Bag End ships as a kit and arrives with all the materials needed to assemble the sod-roof-ready structure. The weight of the assembled structure is approximately 2000 pounds. High quality construction using northern white cedar, treated lumber, a massively reinforced roof structure using multiple layers of waterproof membrane, and stainless steel fasteners all assure that your investment will return years of beauty and enjoyment. Site preparation, assembly, and installation/landscaping are all significant aspects of a completed Bag End project. The price listed is for the structure only. We are happy to work with you or your landscape professional to advise on an overall budget for the project. Wooden Wonders also offers delivery and installation service for projects on a case by case basis. Landscaping shown in the photos was performed by Wooden Wonders. Our quality constructed, hand made products are made out of premium grade natural materials from the forests of Maine and are built to order. Order turnaround time varies from two weeks to ten weeks, depending on the time of year and our current order volume. Your investment in one of our Hobbit Holes will be returned with years of enjoyment and memories that will last a lifetime. To place an order, simply call us at 855-HOBBITHOLE and we'll be glad to take your order by phone. You can also use our online store to place your order. Contact us with questions or to discuss the best option for you! Questions about our Hobbit Hole Playhouses? Ask Away!